Free delivery and promotional codes for use when buying fruit, vegetables and plants online at YouGarden.com. YouGarden.com are a leading supplier of top quality grow your own garden plants, trees, fruits and shrubs at affordable prices including a selection of garden buildings, pots and accessories. Free delivery is available from time to time with voucher codes and discounts released on a regular basis. 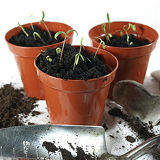 YouGarden.com is an online garden centre selling a range of grow-your-own fruits, plants, shrubs and flowers. Browsing the homepage reveals a full page rotating banner promoting the discount club. This is great for both new and existing users looking for a quick way to save a bit off your order. At the time of writing there’s a 10% discount up for grabs as well as money off vouchers. The menu offers a selection of product categories which reveals a sub-menu for easy navigation. Great emphasis is put on user interaction and sign up to encourage engagement and repeat purchases. There’s also focus on user reviews, help and support and satisfaction of service, this is highlighted when scrolling down the page. One disappointment is the lack of delivery cost information. The shipping information page is simply a paragraph explaining to check the delivery charges at the basket. A little pre warning of delivery costs would be useful. Looking around there doesn’t seem to be any free delivery options available. The product details page provides a full description, good quality image and product rating. Gift cards and promotional codes can be entered at the basket stage with no need to register at this point. Adding more items seems to increase the shipping cost which I guess is logical but could be free over a certain level. The discount club saving is shown to encourage customers to join up. Payment can be made with either credit or debit card and PayPal checkout or Amazon Pay, so lots of choices there. Contact details can be found at the bottom of the page with a ‘leave a message’ tab for quick communication.